Birding Is Fun! : Finch Irruption & Eye Candy Happening Now! 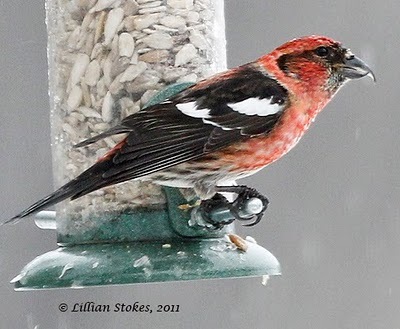 Wow, it's raining finches (and other irruptive species), hallelujah, here, now in NH, and I had to share it with you. We are inundated with Pine Siskins. We had 80 in our yard today. And hot on their heels are some other irruptive visitors; Evening Grosbeaks and Purple Finches. Avian eye candy is competing with the spectacular fall leaves. Pine Siskins are jamming the feeders, I like the yellow wing stripe (normally hidden) showing on this Pine Siskin in flight. 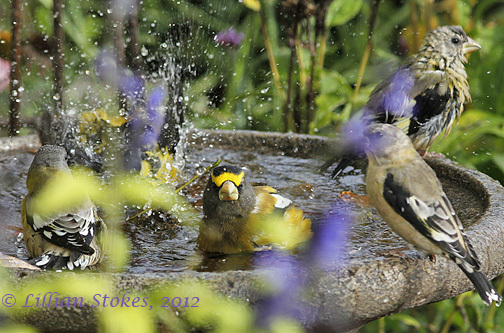 Evening Grosbeaks, ABA's 2012 bird of the year, came in a flock. Here are two males. A Pine Siskin posed on the perch near the bird bath, (photography hint, set up wooden perches as landing spots near the feeders and bath, for great photo ops). There is standing room only for the siskins. 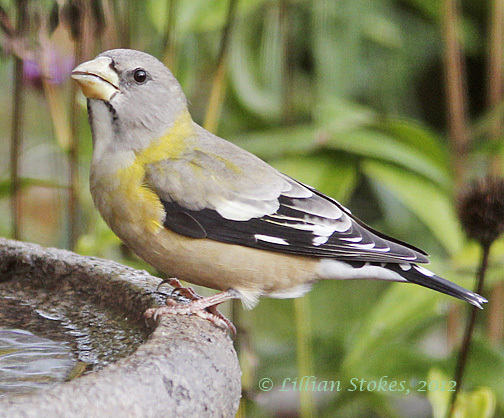 This female Evening Grosbeak drank the water by sipping then tilting her head back..
then the whole flock tried to fit in, and it became an Evening Grosbeak water park. The Purple Finch males and a Pine Siskin looked on. 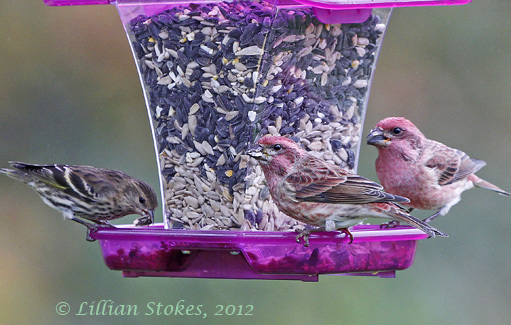 There are 3 species of finches and a grosbeak in this photo. Can you tell who is who? 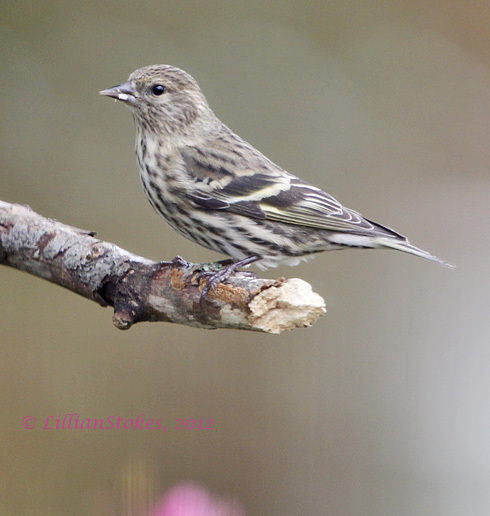 Birders in NH and elsewhere are reporting big flocks of Pine Siskins at their feeders. The annual Winter Finch Forecast of Ron Pittaway of the Ontario Field Ornithologists is predicting this will be a big irruptive year for many species. Irruptive bird species are ones who move or "irrupt" out of their usually more northern range and come down into the lower U.S., due to a lack of winter food. The Finch Forecast says there is a widespread tree-seed crop failure from northeastern Ontario, eastward and down into the New England States. 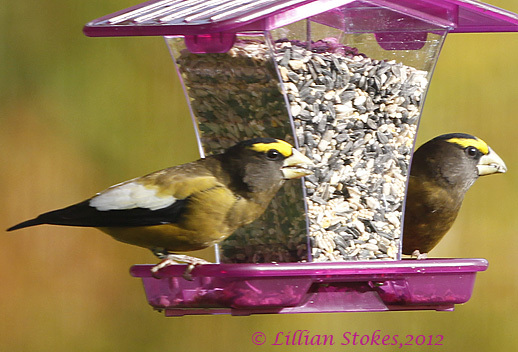 Purple Finches will migrate south of Ontario this fall and Evening Grosbeaks will appear at feeders in central Ontario and the Northeast. We have not seen White-wined Crossbills, a very cool irruptive species, yet, but they may wander and show up throughout the Northeast. 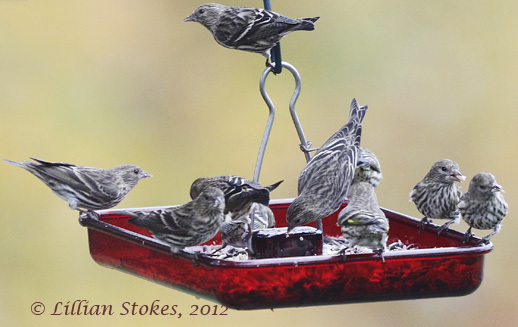 To attract irruptive species, put out multiple feeders, keep them full and clean, and provide cover near feeders. Who knows what amazing irruptive bird species you may see this winter. Have Fun! How great is must be to have so many colorful, terrific birds in your yard! Thanks, MIa, I hope lots of these birds show up in your yard and the yards of many other birders as well! Reconheço aqui muito trabalho e dedicação. Obrigado pela contribuição prestada á natureza. Lovely photos, Lilian! 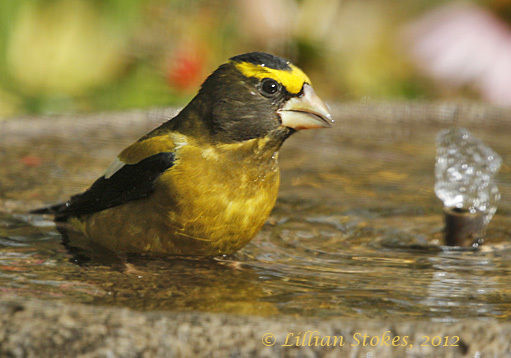 Love the shots of the Evening Grosbeaks bathing and hope to see some in my yard too this fall and winter. 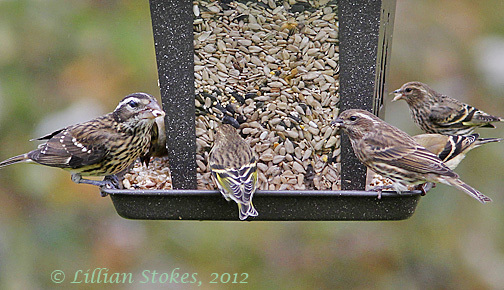 I remember my feeders being overwhelmed by Pine Siskins several years ago. So they are going to be back this year? Great images, Lillian! I hope the irruption extends into northern Illinois when I get there later this month! 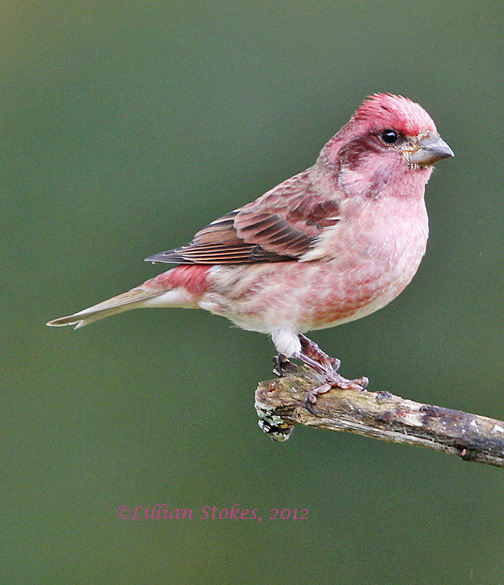 Wow, I am envious of your photo of the male purple finch, fantastic. 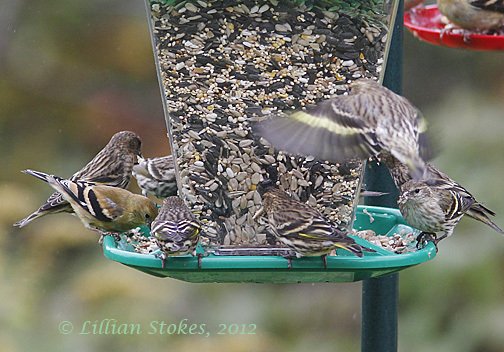 I happened upon your page looking for pics of pine siskins which seem to have invaded my feeders today. I wanted to be sure before I posted at the Cornell site. Thank you, your photos sealed the deal! It was gloomy here and hard to actually spot the yellow, more of an impression than anything else. So many stunning birds visiting your feeders! I would love to see the variety and numbers of beauties in our backyard. Last year, I was thrilled to see two Snowy Owls with the Snowy Owl irruption that occurred. Wonderful post filled with terrific photographs! Thanks, Julie and everyone, irruptive species can show up anywhere and this may be a big year for them, keep looking! I have many colorful birds that you have and some you don't but I wish I could photograph them like you do. Fabulous.